Humpback dolphins are found in relatively shallow nearshore waters throughout their range which includes most of the coastlines in Australia, Africa and Asia. Their dependence on nearshore habitats brings them into contact with many types of human activities, putting them at risk from fisheries entanglement, boat traffic, pollution, and habitat loss. However, this habitat selection also makes them easy to observe from shore. There are four recognized species of humpback dolphins with very little overlap between their ranges: the, Indo-Pacific humpback dolphin (Sousa chinensis), the Indian Ocean humpback dolphin (S. plumbea) the Atlantic humpback dolphin (S. teuszi) and the Australian humpback dolphin (S. sahulensis)1. Because they tend to be relatively shy, and less active than the bottlenose dolphins with which they often share territory, this species is not often the primary target of dolphin watching tours. However, they can be encountered in nearshore waters, and in some areas, like Hong Kong, and the Musandam Peninsula of Oman, they are the stars of the show. Indian Ocean humpback dolphins (Sousa plumbea) off the coast of Pemba, Tanzania. Photo courtesy of Gill Braulik. 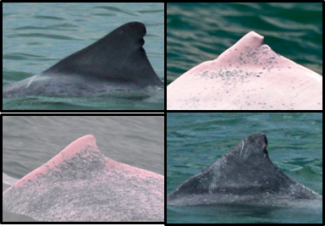 Indo-Pacific humpback dolphins are born an even grey colour, and can progress through different stages of pigmentation change – with some adults becoming nearly all white/pink, as is common in the populations off the coast of China/Hong Kong, and less common in Malaysian Borneo as pictured above (photos courtesy of the Sarawak Dolphin Project). Indian Ocean humpback dolphins remain a lead grey colour throughout their lifespan, and have more pronounced humps under their dorsal fins than their Indo-Pacific or Atlantic counter-parts, as evidenced by these photos from Oman (left, courtesy Graeme Hornby), and Gabon (centre and right, courtesy Gianna Minton/WWF Gabon). Australian humpback dolphins, such as these in northern Queensland are slightly lighter in colour than Indian Ocean or Atlantic humpbacks, and have a distinctive diagonal dark grey dorsal ‘cape’ – most visible in the photo on the left. Photos courtesy of Guido Parra. 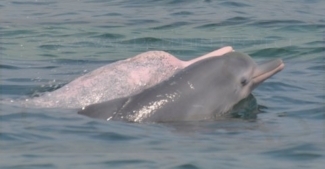 In general, the pink coloration of adults and/or the presence of a hump under the dorsal fin will make humpback dolphins easy to distinguish from any other medium to large dolphin in their range, which most often overlaps with coastal forms of bottlenose dolphins, finless porpoises, and Irrawaddy or snubfin dolphins. 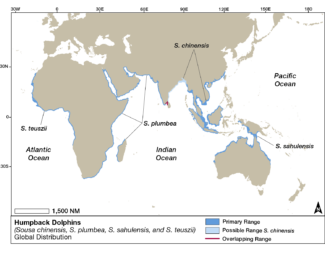 Some populations of Indo-pacific humpback dolphins (e.g. off the coast of peninsular Malaysia) have smaller, less pronounced humps under their dorsal fins, and young individuals that are still evenly grey in colour may initially be difficult to distinguish from bottlenose dolphins. However, the longer, flatter rostrum, the broad base of the dorsal fin, and the presence of other individuals with mottling and/or more pronounced humps should differentiate humpback dolphins. Indian Ocean humpback dolphins are native to: Bahrain; Bangladesh; Comoros; Djibouti; Egypt, Eritrea; India; Iran; Iraq; Israel; Kenya; Kuwait; Madagascar; Mayotte; Mozambique; Myanmar; Oman; Pakistan; Qatar; Saudi Arabia; Somalia; South Africa; Sri Lanka; Sudan; Tanzania; UAE; Yemen. Humpback dolphins seem to be fairly adaptable in their diet, with studies from South Africa, Hong Kong, Australia and Oman revealing a variety of fish species, and sometimes crustaceans, squids, octopus and cuttlefish in the stomachs of by-caught or stranded animals2-6. Humpback dolphins use a variety of feeding techniques, including partially stranding themselves on shore while chasing fish7. In some locations, humpback dolphins are also known to follow fishing trawlers in order to opportunistically feed on discarded and escaped fish8. 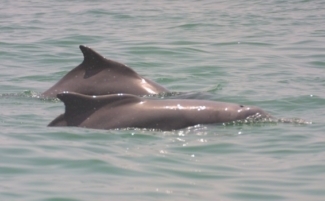 Humpback dolphins usually occur in small groups of 2-6 individuals, but larger aggregations of up to 30 or 50 individuals have been recorded from Oman9,10, and Malaysia11, and over 100 individuals from Bangladesh8. Males often show scarring consistent with aggression within their own species – such as tooth rakes on their dorsal fins12. The species also appears to interact with other dolphin species in its range, with a number o documented cases of both benign and aggressive interactions between bottlenose dolphins and humpback dolphins10, and the apparent incorporation of an Irrawaddy dolphin into humpback dolphin groups in two different sites in Malaysian Borneo13,14. Females of all four species are thought to reach sexual maturity at 9-10 years. In Hong Kong and South Africa, calves are predominantly born in the spring and summer, but little is known about the seasonality of reproduction or other life history characteristics of Australian or Atlantic humpback dolphins7,15. Adult Indo-Pacific humpback dolphin and calf in Sarawak, Malaysia. Photo courtesy of Cindy Peter, Sarawak dolphin project. As with many other species of whales and dolphins, individual humpback dolphins can be recognised from the unique patterns of scarring and pigmentation on their dorsal fins. Researchers build up catalogues of known individuals and track them over time. Because almost all humpback dolphin populations have fairly stable nearshore home ranges, they provide excellent subjects for long-term monitoring, including studies of social structure, reproductive parameters, residency and range16,17. Because their nearshore habitat also brings them into contact with human activity, they are also the focus of studies that try to assess the potential impact of coastal development and other threats on dolphin populations18. For more information about methods used to study whales and dolphins click here. Humpback dolphins throughout Africa, Australia and Asia often live in close proximity to densely populated urban areas. In developed areas, like Hong Kong, their habitat is continually affected by coastal construction and high volumes of vessel traffic. In developing countries, their distribution often overlaps with areas where fishing effort is exponentially increasing7,20. As with almost all species of whales and dolphins, accidental entanglement in fishing gear – or bycatch- is the leading source of human-induced mortality for humpback dolphins21, but coastal development18, pollution22-24, and in some areas, such as West Africa, direct hunting25 also pose serious threats. The IUCN Red List status of all four species of humpback dolphins has recently been re-assessed, resulting in the current designations: (1) Atlantic humpback dolphin - critically endangered,25,26; (2) Indian ocean humpback dolphin -endangered,27,28; (3) Indo-Pacific humpback dol­phin- vulnerable8,29; and (4) Australian humpback dolphin - vulnerable30,31. Of all four species, Atlantic humpback dolphins are considered the most severely at risk of extinction, and are listed on Appendix I of the Convention on Migratory Species (CMS). The IWC also considers this species of the utmost priority for conservation action32. Individual humpback dolphins can be recognised by the nicks and scars on their dorsal fins, through a process called photo-identification. These are Indo-Pacific humpbacks from Malaysian Borneo. Photos courtesy of Sarawak Dolphin Project. A pair of Indian Ocean humpback dolphins in Oman: Photo courtesy Gianna Minton. Despite the fact that humpback dolphins are found near shore- and thus in theory easily accessible for dolphin watching - because they are generally less approachable and less acrobatic than other species, they are not often the primary target of whale and dolphin watching activities. There are a few locations where the species is regularly encountered during marine and coastal tourism activities, and some where they form the focus of tours, such as India33, Hong Kong34 and mainland China35 and the Musandam Peninsula in Oman. Studies on the potential impact of boat-based tourism on humpback dolphins are limited, but include a studies in Hong Kong36 and Zanzibar37,38 that found that dolphins’ behaviour was likely to change in response to fast-moving vessels. Given humpback dolphins’ poor conservation status, their complete reliance in near-shore habitats and their generally restricted home ranges, the implementation and enforcement of clear and precautionary whale watching guidelines are particularly important for this species. Humpback dolphin and dolphin watching vessel off the coast of India. Photo courtesy of Dipani Sutaria. Barros, N. B., Jefferson, T. A. & Parsons, E. C. M. Feeding Habits of Indo-Pacific Humpback Dolphins (Sousa chinensis) Stranded in Hong Kong. Aquatic Mammals 30, 179-188 (2004). Parra, G. J. & Jedensjö, M. Stomach contents of Australian snubfin (Orcaella heinsohni) and Indo-Pacific humpback dolphins (Sousa chinensis). Marine Mammal Science, n/a-n/a, doi:10.1111/mms.12088 (2013). Plön, S., Cockcroft, V. G. & Froneman, W. P. Chapter Six - The Natural History and Conservation of Indian Ocean Humpback Dolphins (Sousa plumbea) in South African Watersin Advances in Marine Biology Vol. Volume 72 (eds A. Jefferson Thomas & E. Curry Barbara) 143-162 (Academic Press, 2015). Ponnampalam, L. S. et al. Stomach contents of small cetaceans stranded along the Sea of Oman and Arabian Sea coasts of the Sultanate of Oman. Journal of the Marine Biological Association of the United Kingdom 92, 1699-1710, doi:doi:10.1017/S0025315411002104 (2012). Venter, K. The Diet of Humpback Dolphins (Sousa chinensis) from teh Anti-Shark Nets off KwaZulu-Natal BSc Hons thesis, Grahamstown, South Africa, (2009). Parra, G. & Jefferson, T. in Encyclopedia of Marine Mammals Vol. Third Edition (eds B Würsig, J.G.M. Thewissen, & K.M. Kovacs) (Academic Press, Elsevier, 2017 (in press)). Jefferson, T. A. & Smith, B. D. in Advances in Marine Biology Vol. Volume 73 (eds A. Jefferson Thomas & E. Curry Barbara) 1-26 (Academic Press, 2016). Baldwin, R. M., Collins, M., Van Waerebeek, K. & Minton, G. The Indo-pacific humpback dolphin of the Arabian region: a status review. Aquatic Mammals 30, 111-124 (2004). Minton, G., Collins, T. J. Q., Findlay, K. P. & Baldwin, R. Cetacean distribution in the coastal waters of the Sultanate of Oman. Journal of Cetacean Research and Management 11, 301-313 (2010). Zulkifli Poh, A. N., Peter, C., Ngeian, J., Tuen, A. A. 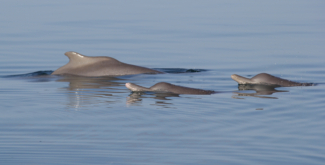 & Minton, G. Population Estimates of Indo-Pacific Humpback Dolphins (Sousa chinensis) in Kuching Bay, East Malaysia. Aquatic Mammals 42, 462-465, doi:10.1578/AM.42.4.2016.462 (2016). Brown, A. M. et al. in Advances in Marine Biology Vol. Volume 73 (eds A. Jefferson Thomas & E. Curry Barbara) 273-314 (Academic Press, 2016). Kamaruzzan, A. S. & Jaaman, S. A. Interactions between Indo-Pacific humpback and Irrawaddy dolphins in Cowie Bay, Sabah, Malaysia. The Malayan Nature Journal 64 (2013). Zulkifli Poh, A. N., Peter, C., Ngeian, J., Tuen, A. A. & Minton, A. G. Abundance Estimates of Indo-Pacific Humpback Dolphins (Sousa chinensis) in Kuching Bay, East Malaysia. Aquatic Mammals 42, 462-465 (2016). Amaral, A. R. et al. Update on Genetic Analyses of Arabian Sea Humpback Whales. 6 (IWC, Bled, 2016). Jefferson, T. A., Hung, S. K., Robertson, K. M. & Archer, F. I. Life history of the Indo&dash;Pacific humpback dolphin in the Pearl River Estuary, southern China. Marine Mammal Science 28, 84-104 (2012). Parra, G. J., Corkeron, P. J. & Marsh, H. Population sizes, site fidelity and residence patterns of Australian snubfin and Indo-Pacific humpback dolphins: Implications for conservation. Biological Conservation 129, 1 6 7 –1 8 0 (2005). Jefferson, T. A. & Curry, B. E. Humpback Dolphins (Sousa spp. ): Current Status and Conservation, Part 1 in Advances in Marine Biology Vol. 72 266 pp. (2015). Jefferson, T. A. 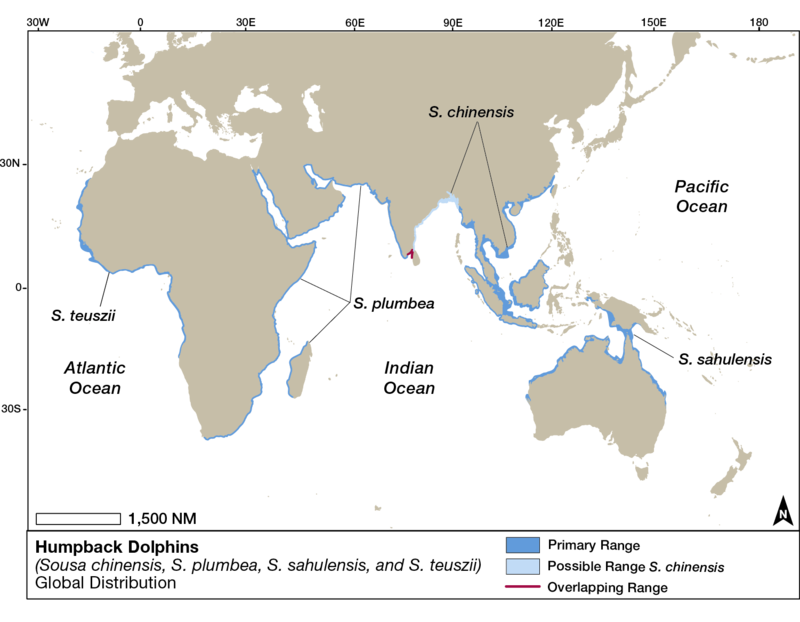 & Curry, B. C. Chapter One - Re-assessment of the Conservation Status of the Indo-Pacific Humpback Dolphin (Sousa chinensis) Using the IUCN Red List Criteriain Advances in Marine Biology Vol. 72 (eds T. Jefferson & B. C. Curry) 296 (Elsevier, Academic Press, 2016). Cagnazzi, D. et al. Anthropogenic contaminants in Indo-Pacific humpback and Australian snubfin dolphins from the central and southern Great Barrier Reef. Environmental Pollution 182, 490-494 (2013). GUI, D. et al. Mercury and selenium in stranded Indo-Pacific humpback dolphins and implications for their trophic transfer in food chains. PLOS ONE 9(10) e110336. 10pp. 2014., 10 (2014). Collins, T. Chapter Three - Re-assessment of the Conservation Status of the Atlantic Humpback Dolphin, Sousa teuszii (Kükenthal, 1892), Using the IUCN Red List Criteriain Advances in Marine Biology Vol. Volume 72 (eds Thomas. A. Jefferson & Barbara. E. Curry) 47-77 (Academic Press, 2015). Collins, T., Braulik, G. T. & Perrin, W. Sousa teuszii in The IUCN Red List of Threatened Species ( e.T20425A50372734. Downloaded on 10 December 2017., 2017). Braulik, G. T., Findlay, K., Cerchio, S. & Baldwin, R. Chapter Five - Assessment of the Conservation Status of the Indian Ocean Humpback Dolphin (Sousa plumbea) Using the IUCN Red List Criteria in Advances in Marine Biology Vol. 72 (eds Thomas. A. Jefferson & Barbara. E. Curry) 119-141 (Academic Press, 2015). Braulik, G., Findlay, K., Cerchio, S., Baldwin, R. & Perrin, W. Sousa plumbea in The IUCN Red List of Threatened Species (e.T82031633A82031644. Downloaded on 10 December 2017., 2017). Jefferson, T., Smith, B. D., Braulik, G. & Perrin, W. Sousa chinensis in The IUCN Red List of Threatened Species (e.T82031633A82031644. Downloaded on 10 December 2017., 2017). Parra, G. J. & Cagnazzi, D. Chapter Seven - Conservation Status of the Australian Humpback Dolphin (Sousa sahulensis) Using the IUCN Red List Criteria in Advances in Marine Biology Vol. Volume 73 (eds A. Jefferson Thomas & E. Curry Barbara) 157-192 (Academic Press, 2016). Parra, G., Cagnazzi, D., WF, P. & Braulik, G. Sousa sahulensis in The IUCN Red List of Threatened Species (e.T82031633A82031644. Downloaded on 10 December 2017., 2017). Sutaria, D. et al. 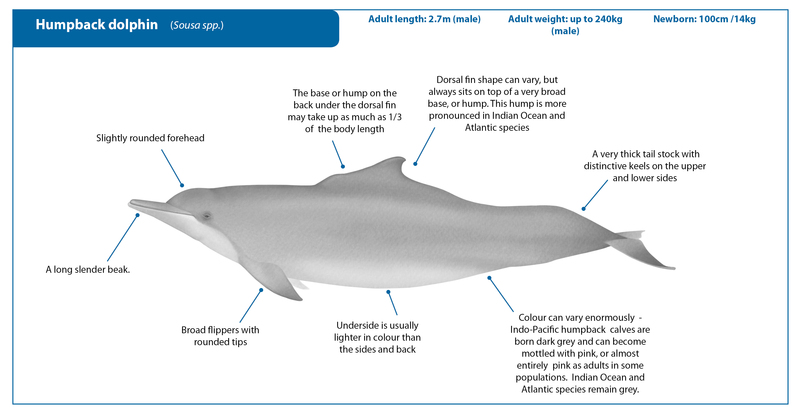 Chapter Nine - Humpback Dolphins (Genus Sousa) in India: An Overview of Status and Conservation Issues in Advances in Marine Biology Vol. Volume 72 (eds A. Jefferson Thomas & E. Curry Barbara) 229-256 (Academic Press, 2015). Yeung, W. Y. Study on the impact of dolphin-watching activity on Indo-Pacific humpback dolphin (Sousa chinensis) Chinese white dolphin in Hong Kong waters, University of Hong Kong, (2003). Chen, B. et al. in Advances in Marine Biology Vol. Volume 73 (eds A. Jefferson Thomas & E. Curry Barbara) 119-139 (Academic Press, 2016). Ng, S. L. & Leung, S. Behavioral response of Indo-Pacific humpback dolphin (Sousa chinensis) to vessel traffic. Marine Environmental Research 56, 555-567 (2003). Berggren, P. et al. Sustainable dolphin tourism in East Africa. 72 (WIOMSA, Zanzibar, 2007). Christiansen, F., Lusseau, D., Stensland, E. & Berggren, P. Effects of tourist boats on the behaviour of Indo-Pacific bottlenose dolphins off the south coast of Zanzibar. Endangered Species Research 11, 91-99 (2010).